OK, so I’m a dad. 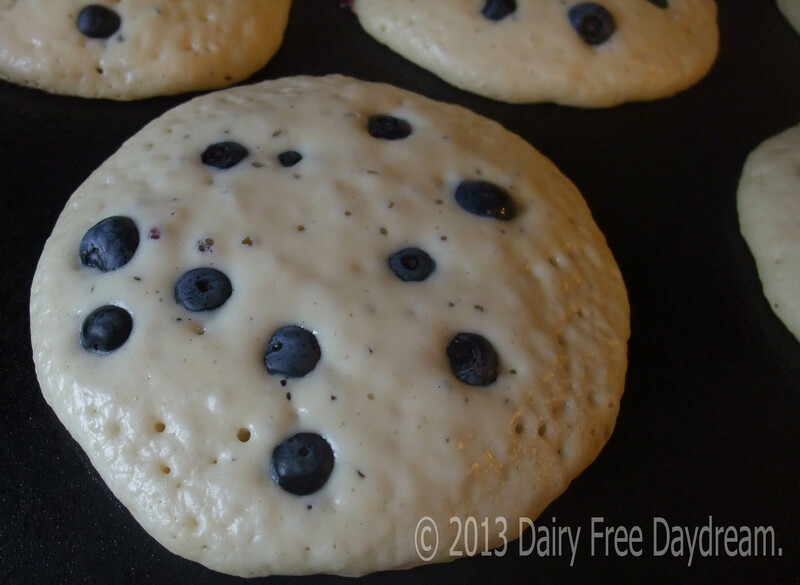 There seems to be an unwritten rule that dads make pancakes on the weekends. I don’t know if this has to do with dads being at work Monday to Friday and moms getting a break from preparing every meal throughout the week; I didn’t write this rule, I just revel in it. My dad made pancakes when we were growing up, and he still loves making pancakes for family gatherings; Uncle Paul’s Pancakes are kinda world-famous, for us. Translating over pancakes into a dairy free recipe is fairly straight forward. You are substituting out the milk, and then adjusting for the change in consistency. One other option we are going to do to aim just a bit further by mimicking the acidity of buttermilk. The reason buttermilk pancakes are so popular, is how the acid from the buttermilk reacts with the baking soda to increase the leavening that happens. We can recreate this by adding a small amount of vinegar to the rice milk and letting this sit for several minutes while we get the dry ingredients prepared. I could not believe how much difference this made; lighter, fluffier, and gone quick! And yeah, so its blueberry season (if I can get this posted before apple season, that is), so what better thing to do to your pancakes than add blueberries. Fresh is of course best for this recipe, but frozen thawed berries work great as well. 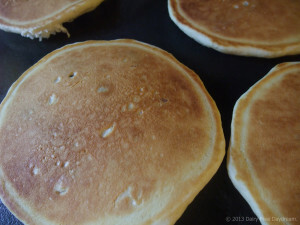 Timing the thawing is important, though, as too long and they may get mushy before you get them on the griddle, and not enough time to thaw and they will be too frozen when you put them in, interfering with how the pancakes cook. 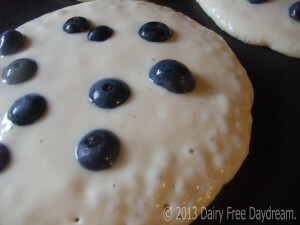 When using frozen, bring them out as the first step before you start putting the batter together, and this should give them the right amount of time. 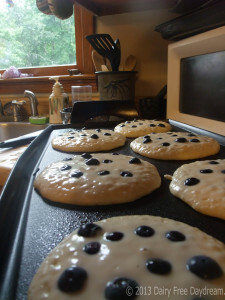 I use a counter top plug-in griddle set to 300 F, and Pam baking spray on the griddle. I have tried others, but some of the other sprays do not do well with the heat of the griddle, so I keep coming back to the baking spray. Ok, technique tip, very important. You want to let the pancake cook on the one side as long as you can before flipping it, this makes all the difference in that light n fluffy awesomeness that you want in the pancake. Ok, technique tip, very important. 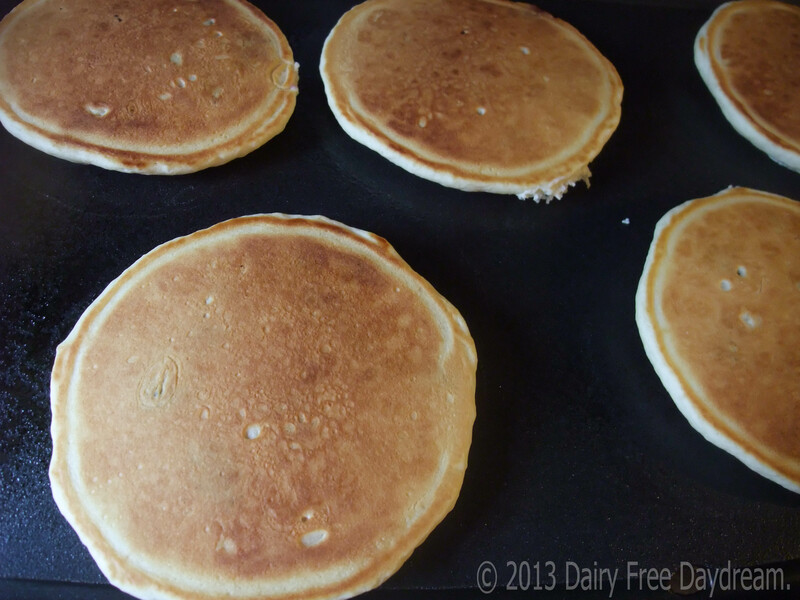 You want to let the pancake cook on the one side as long as you can before flipping it, this makes all the difference in that light n fluffy awesomeness that you want in the pancake. The two pictures below are to highlight what you are looking for. 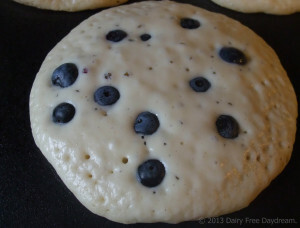 First, notice how the blueberries are disappearing, yeah, that’s a good sign that we got our acidity right for the leavening. Next, the bubbles have come up, and popping along the outer edges. At that point you have waited as long as you want to wait, flip ‘em now! Great sign that you timed it right, golden brown all the way across. Once they are done, the bottom sides will have that same golden brown – “let’s get a plate and syrup and some buttery dairy-free spread” look to them, and you know you’re ready for breakfast. 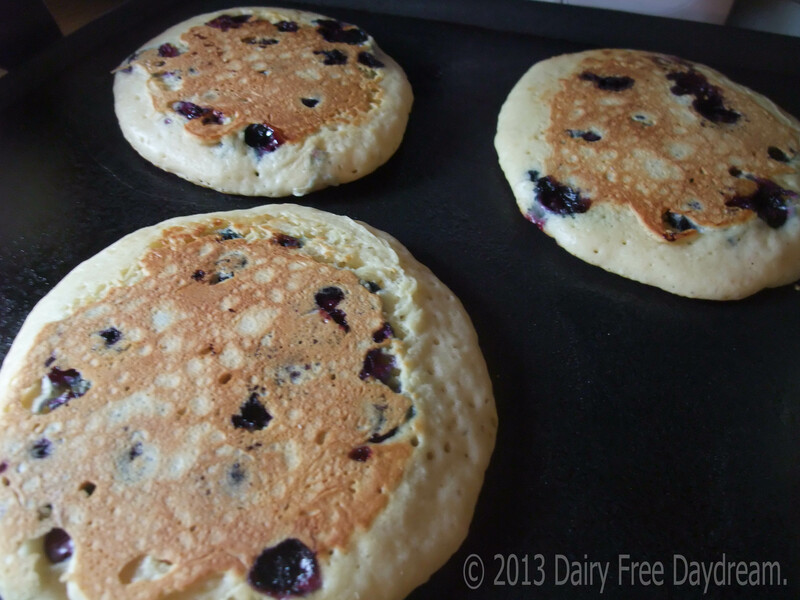 If using a griddle, set to 300 F.
If you are using frozen blueberries, place in a small colander and rinse thoroughly. Mix the vinegar and the rice milk in a medium bowl and set aside. 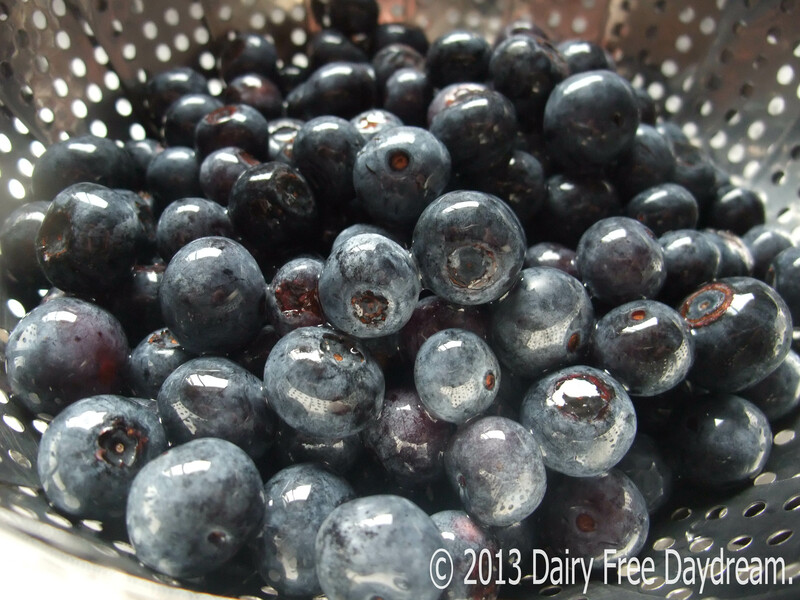 If you are using frozen blueberries, rinse again. In a large mixing bowl, combine the flour,/ sugar, baking powder, baking soda, and salt. Beat egg and add egg and canola oil to rice milk mix. Pour wet ingredients into dry ingredients and mix. 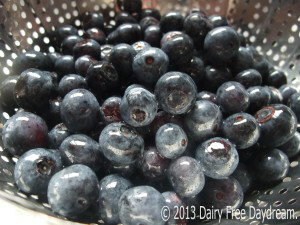 If you are using frozen blueberries, rinse again. Once cooking surface is heated, apply non-stick spray to area before adding batter. Pour 1/3 C of batter onto surface, repeat as surface area permits. Add several blueberries to each pancake on the cooking area. 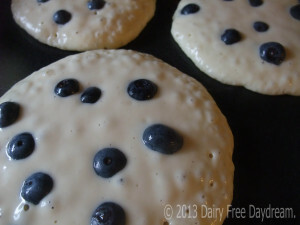 When bubbles along edges begin to pop (see image above), flip pancakes. Second side will take less time than the first, and is dependent on how hot your surface is. 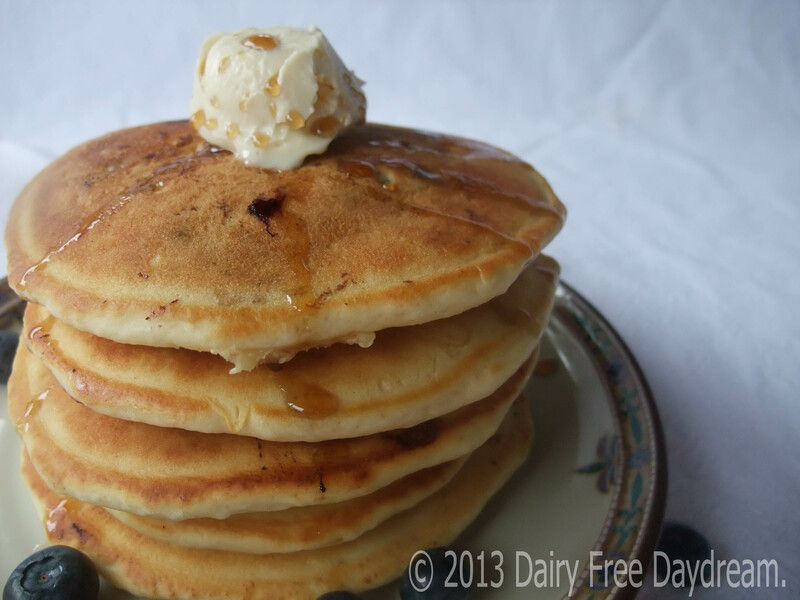 When the second side is done, remove and serve, adding your favorite buttery non-dairy spread and real maple syrup.